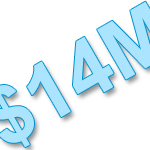 We have just reached the $14 million milestone, only a few weeks after passing $13 million! We have received donations both large and small and every $4 matters as every net matters. 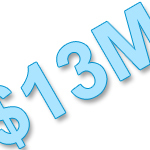 We have just passed the $13 million mark, thanks to a donor from San Francisco, USA! Every donation from every person counts as the total of $13,120,514 from over 54,000 donations and transactions, in 168 countries, indicates. 100% buys nets. That's 3,038,427 nets, protecting more than 5 million people. 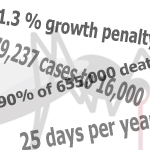 2012 has been a good year for Against Malaria. With your support we have almost reached the $13 million raised mark and we would like to share a few of the highlights with you. In the coming months we intend to publish status information for each potential distribution being assessed. Information will be presented in a format similar to that shown on our Future distributions page. AMF has been ranked #1 for the second year running! 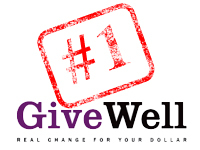 We are delighted to say GiveWell has just announced its updated top charity ranking... and AMF has been ranked #1 for the second year running! 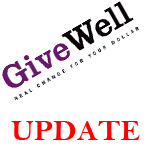 GiveWell has said, "...of all the charitable interventions we know of that have clear room for more funding, this one has the strongest evidence of effectiveness and cost-effectiveness. AMF has outstanding self-evaluation and transparency. It first became our #1 charity in late 2011 and has continued to impress us." We have approved a distribution of 250,000 nets in the districts of Balaka and Dedza in Malawi. The distribution would take sleeping space coverage levels from 30-60% (the level is currently unknown) to 90% and above. We are discussing the funding of non-net costs and the timing of the pre-distribution registration survey with our distribution partner. We expect the distribution to place before the end of Q1 2013. The distribution partner is Concern Universal, Malawi, with whom we distributed 270,000 nets in Ntcheu district from January to April 2012. An NMCP coordinated distribution of nets took place in the districts in the middle of 2012. Further nets are required to achieve universal coverage. We are assessing nine distributions of between 60,000 and 4 million nets each. The distributions are in Angola, Burkina Faso, Cameroon, Malawi, Mali, Nigeria, Senegal and Sierra Leone. In one country we are lookng at several separate distributions. Assessments are at different stages. This information and future updates can be found in our recently launched Future Distributions section. 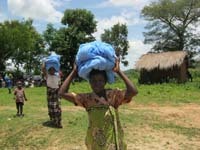 We have not proceeded with three potential distributions being considered during 2012 in Malawi, Togo and Mali. Through January to June 2012 we offered to contribute 600,000 to 1 million nets to close the gap in nets required to achieve universal coverage. The NMCP would not progress discussions about sharing the extensive pre-distribution registration data they said they had. 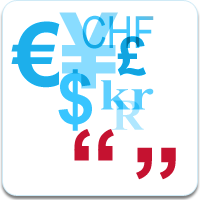 We considered it important for us to see to this information before contributing nets. gathered at least six months previously when discussions first began and at least 12 months old when we withdrew from discussions. Unrest and fighting, including killings, in Mali have led to security fears and safety concerns. Our distribution partner has on several occasions withdrawn staff from the country. This has put our potential contribution of nets on hold. New timing is unknown. The need is for 4 million nets. We have learned it is important to progress more potential distributions at the same time to avoid a delay in converting funds to nets. Is the failure to progress with these distributions a concern? Yes, in that it has meant we have taken longer to convert funds into nets being distributed. What would we do differently if faced with the same situation? Could this be indicative of what we might find when trying to do more large-scale distributions with the degree of accuracy, transparency and accountability we require? We do not think so. What supports this is there is a significant need for nets and the results we have achieved in Ntcheu have generated interest. More distributions with similar results will help further. 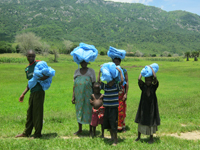 We have received the third three-months set of post-distribution malaria case data following the February 2012 distribution of 270,000 nets in Ntcheu District, Malawi. The results continue to be good. The incidence of malaria in July, August and September 2012 were 41%, 47% and 35% lower than in the corresponding months of the prior year. 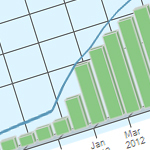 We will continue to collect and publish monthly malaria data and hope to see this decline in malaria rates continue. You can read more about the results and view the malaria case rate data online. “The results of this trial suggest that this candidate malaria vaccine is not ready to become part of the routine panel of infant immunizations. [AMF added bold] However, this trial did show protection in a subset of children and thus should be used as an opportunity to enlighten researchers regarding the host responses that correlate with vaccine protection. There are many vaccine candidates in the pipeline that use alternative parasite targets and vaccination strategies. Whether leaders in malaria-vaccine development will be able to support the costs needed to integrate sophisticated host-response studies or other value-added studies into these future vaccine trials remains to be seen. The results of this immunization trial suggest that a malaria vaccine is possible, but a more detailed understanding of effective host responses will be necessary to achieve this goal and avert the illnesses and deaths associated with this devastating infection for millions of children." We hope significant funding will be directed to vaccine research for the five malaria parasites. While it is the case, currently, there has never been an effective vaccine against a parasite, there is reason to believe scientific research will lead to one being developed. The impact of such a vaccine could be hugely significant. Everyone involved in malaria control has a fervent wish a malaria vaccine is found. There is what could be bad news about one potential malaria vaccine. "An experimental malaria vaccine once thought promising is turning out to be a disappointment, with a new study showing it is only about 30 percent effective at protecting infants from the killer disease. 'If it turns out to have a clear 30 percent efficacy, it is probably not worth it to implement this in Africa on a large scale', said Genton Blaise, a malaria expert at the Swiss Tropical and Public Health Institute in Basel, who also sits on a WHO advisory board. He said the vaccine might work better under certain conditions but more research was needed. Scientists have been working for decades to develop a malaria vaccine, a complicated endeavor since the disease is caused by five different species of parasites. There has never been an effective vaccine against a parasite. Worldwide, there are several dozen malaria vaccine candidates being researched. WHO said it couldn't comment on the incomplete results and would wait until the trial was finished before drawing any conclusions." 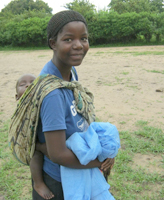 We now have two sets of post-distribution data following the December 2011 to February 2012 distribution of 270,000 nets that achieved universal coverage of a population of 550,000 in Ntcheu District, Malawi and the results are very strong. 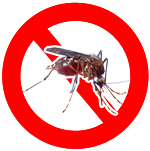 Malaria rates in March to June 2012 are already 50%, 45%, 40% and 40% lower than in the corresponding months in 2011. The six months post-distribution survey of 7,657 households and 15,768 nets showed a hang-up (usage) level of 90% and the percentage of nets in a very good condition is 99% (ninety nine). We will continue to collect and publish monthly malaria data and hope to see a continued and sustained decline in malaria rates. You can read more about the results and see the malaria case rate and survey data online. We have just received our 50,000th donation! (In some cases a single donation received by us actually consists of many hundreds of individual donations, collected as part of a fundraising event.) This milestone donor was Yetzenia Leiva who donated $10 in support of a friend's birthday. Thank you Yetzenia! 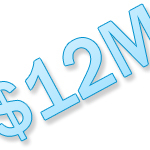 We have also just passed US$11,500,000 raised - see our milestones page. 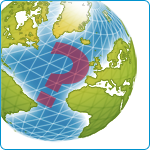 We are currently looking at two significant distributions of 500,000 nets each and hope to make decisions very shortly. Each distribution would protect approximately 900,000 people. Peace Corps Volunteer Ben Gascoigne has a great idea for illustrating the importance of using bed nets in Senegal. A new study suggests 58% of the decline in infant mortality in Sub-Saharan Africa is due to insecticide-treated mosquito nets. It also suggests that the decline has accelerated over the last few years. Do you have a volunteer hour (at a computer) to spare over the next 7 days? 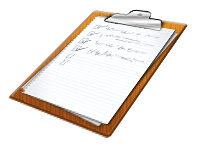 Could you help with some important data entry that requires an hour of your time and some attention to detail? If so please do get in touch as we have a collection of Post-Distribution Survey questionnaires we are adding to the website as part of our reporting to donors. If 10 volunteers respond we can succeed in making the data available to the public in days. We are always keen for volunteers to help us with activities such as photo selecting/captioning, video editing, data entry and more.